Allen R370 with 9 ranks of pipes - Rose City Organ Builders Inc.
With a generous gift given to the music department we were asked to provide a proposal to enhance the existing Allen Organ. We felt that not only tonal improvements should be included in the proposal but visual enhancements as well. 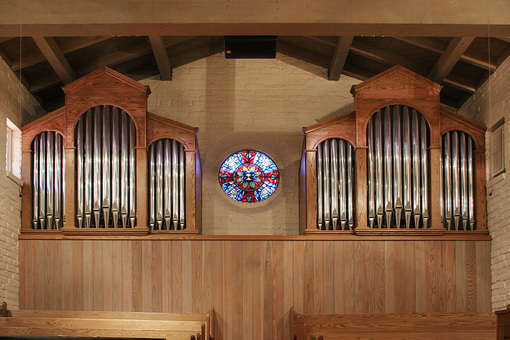 We designed and built the mission style cases to blend in with the existing architecture, flank the beautiful stained glass window, and improve the tonal egress of the organ. The façade pipes are polished zinc and the case is built of solid and oak veneers. The original Allen audio was upgraded utilizing Herald™ loudspeakers with the exception of the Solo division.